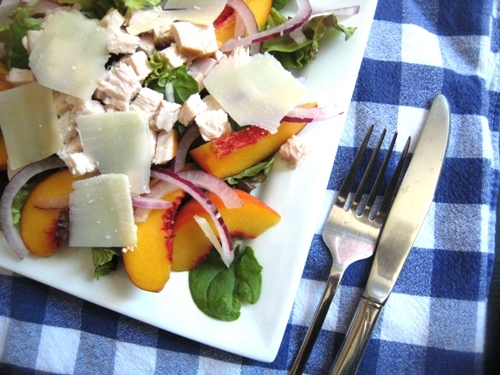 Juicy, late summer peaches make a fabulous foil for smoked turkey breast, Asiago cheese and salad greens. If you like to eat seasonal, this may be your last chance for peaches. We have had our fair share this summer. I was sick of them at one point. And now I kinda miss them. Isn’t that just like fickle me? You’ll love this salad if you’ve got late summer peaches on hand. But, since fruit is so forgiving and versatile when it comes to salads, know that you could trade the peaches for plums, apples, pears, or grapes. It’s all good! Layer the ingredients on a large dinner plate. Drizzle with vinaigrette. This recipe sounds amazing. Cannot wait to try it. I just had this earlier this week, with balsamic and olive oil. YUM! Asiago is my favorite and a far with my littles.